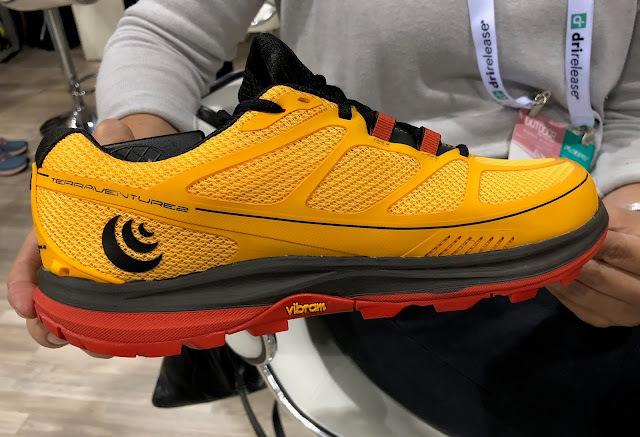 Topo Athletic updates its Hydroventure and Terraventure trail runners with Vibram outsoles, Ortholite insoles and improved uppers while retaining their agile 3mm drop geometries. 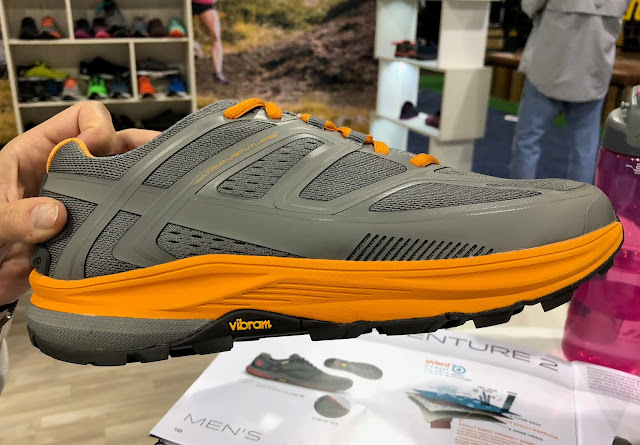 The new Ultraventure ups the cushioning with a 30mm heel, 25mm overall stack and a 3 piece multi density midsole. All Topo shoes share a roomy toe box and heel to toe drops between 0 mm and 5 mm. All of the updates we saw at Outdoor Retailer were to trail shoes. $130. Available October 2019 REI, elsewhere November. 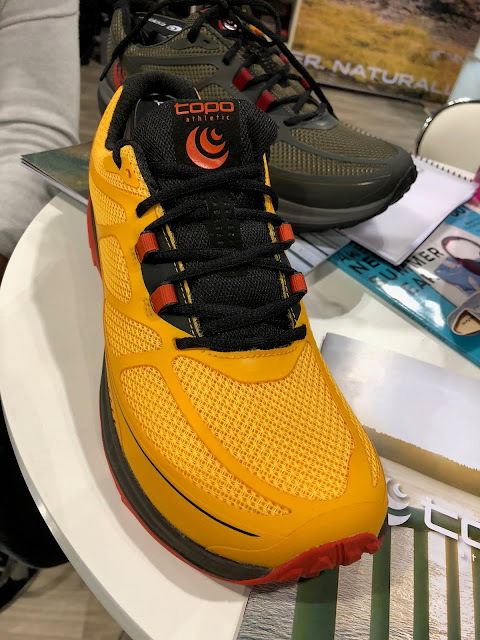 The new Ultraventure can be thought of as the trail cousin of the Ultrafly, Topo's most cushioned road shoe. 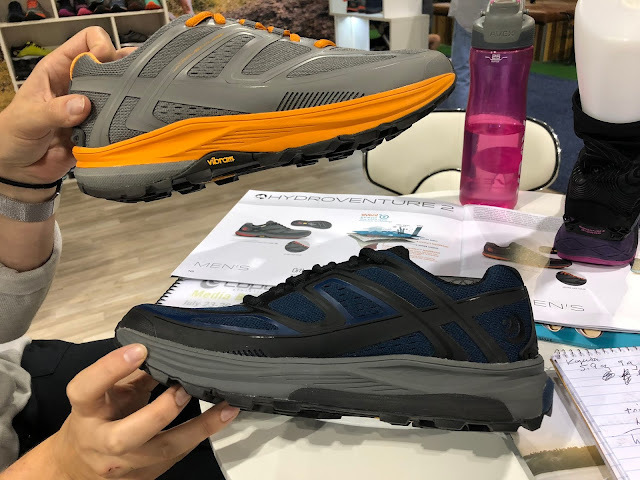 They share similar midsole stack heights and a 3 piece multi density midsoles with the Ultraventure adding more support to the upper, drainage gills, gaiter attachment points for the Topo Stretch gaiter and a very stout Vibram XS Trek outsole. There is no rock plate. Total Stack: 25mm heel/ 22 mm forefoot (incl. 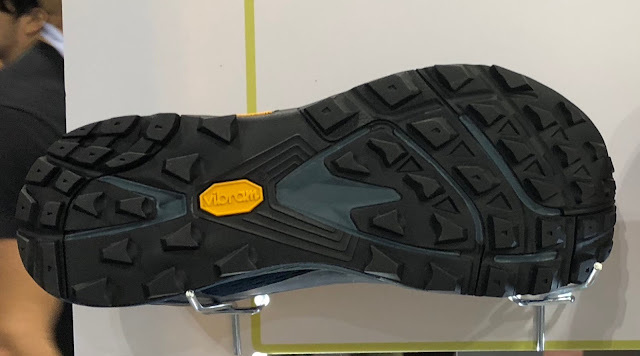 5mm Ortholite insole and 6mm Vibram MegaGrip rubber), 3mm drop. The Hydroventure 2 features a one piece waterproof breathable 3 layer eVent DVdryLT upper. The tongue is fully gusseted. The midsole is dual density: softer under the foot and firmer more responsive closer to the ground. It retains its flexible rock plate. 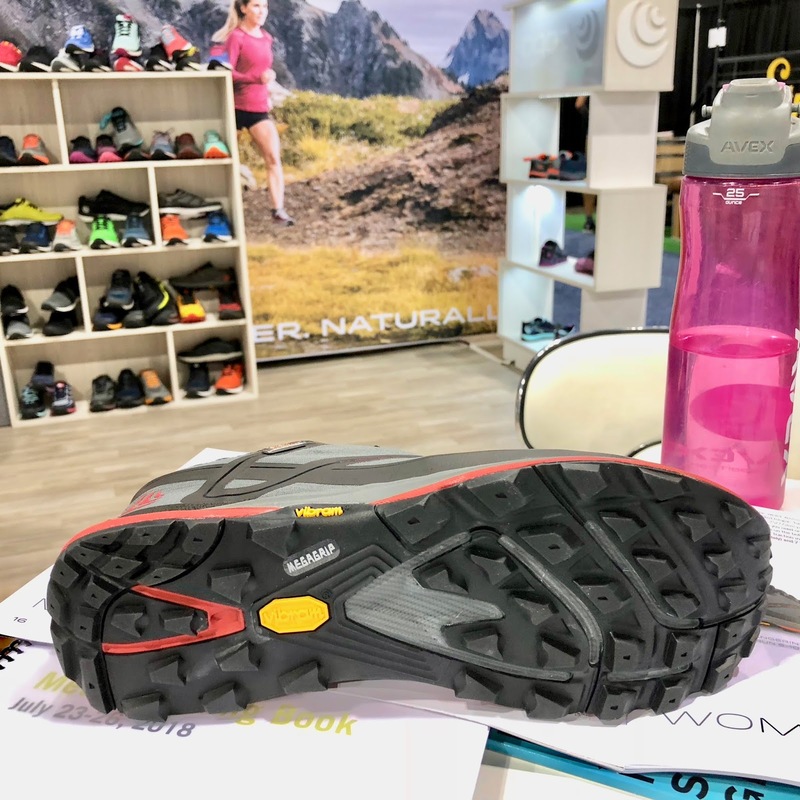 It now is shod with the excellent Vibram MegaGrip outsole with toothier wider spaced lugs than in the prior version making Hydro a great choice for sloppy, rough conditions. It gains 0.5 oz yet remains the lightest of the three here. 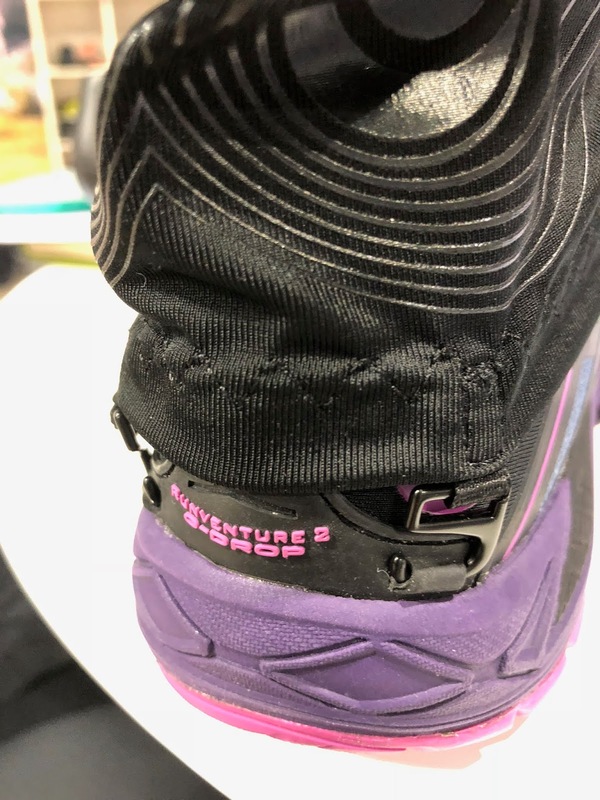 The Hydroventure 2, Terraventure 2, and Ultraventure all feature attachment points for Topo's stretch gaiter. At the heel the attachment is via 2 hooks which slip into channels on the shoe. As with other Topo here the Terraventure gets a Vibram XS Trek outsole with more generously spaced lugs and a flexible rock plate. It has drainage gills and the gaiter attachment. It gains 0.4 oz. I would bet the Ultraventure becomes a popular choice with thru-hikers that are dissatisfied with Altra's durability issues. Topo has built a reputation in our store for lasting much longer than the average shoe. I was just curious about the insole height being called out as included in stack height. Is that different from how other companies do it? ie if I was looking at the Ultraventure and wanted to find a similar stack height Salomon, for example, I should subtract the insole height and look for a 25/20mm shoe? 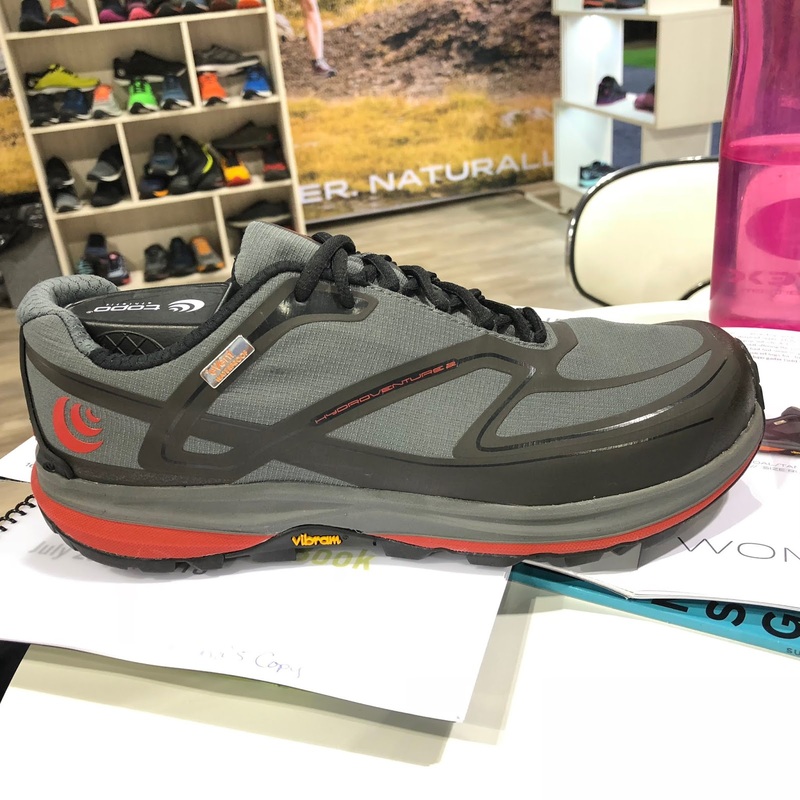 Is Topo switching to an Ortholite insole on all its new and updated shoes including the Terraventure 2? In the first version, if the shoe got wet the insole bunched up into the toe of the shoe. I would think an Ortholite insole would fix this. 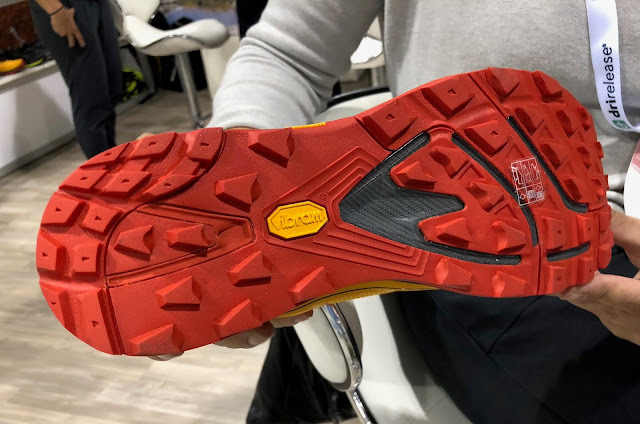 If so with that, the new styling, and Vibram rubber outsole, it should be a far better shoe then the Lone Peak at the same price. Ortholite sockliners are sponges and the worst when wet. If expecting to get wet, I'd switch them out. I’m looking forward to Topo’s new trail line up. However, I need a shoe the that can handle both roads and trail. I run on a variety of surfaces and need one shoe that can transition through all terrain. My concern is the larger, farther spaced lugs will wear down, on hard (asphalt, concrete) surfaces, too quickly. My go to shoe, for trails and roads was the Topo Fli-Lyte 1. When the Fli-Lyte 2 came out, I liked the upgrades, however I was concerned about the amount exposed EVA on the outsole and its durability. 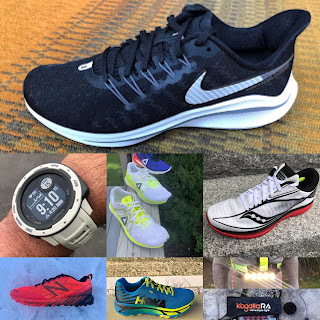 I thought the Fli-Lyte 1 had the right amount of outsole rubber for roads and trails. I would wear my Fli-Lyte 1 until I wore holes in them. I’ve also run in the MT 1 & currently MT 2, which are great shoes, but not the Fli-Lytes I love. 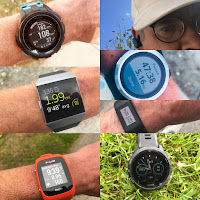 Scrolling through these Topo trail previews leaves me annoyed and a bit disgusted. Every model gains weight and complexity, a trend perfectly exemplified by the proprietary, heavy, complicated gaiter, with not one but two metal hooks on the back: Ridiculous. Topo needs a design philosophy overhaul.